Every country has its unique delicacies and New Zealand is no exception. We’re always on the lookout to try local favourites and usually willing to try anything at least once (except maybe in China). We found New Zealand to be charming, with few frills. This certainly flowed through to the food we ate, and we were lucky to enjoy some outstanding meals as we made our way around the South Island. A stand out was delicious blue cod, caught the same day from local fishing boats, served simply grilled. There were some interesting foods we’d never had before. 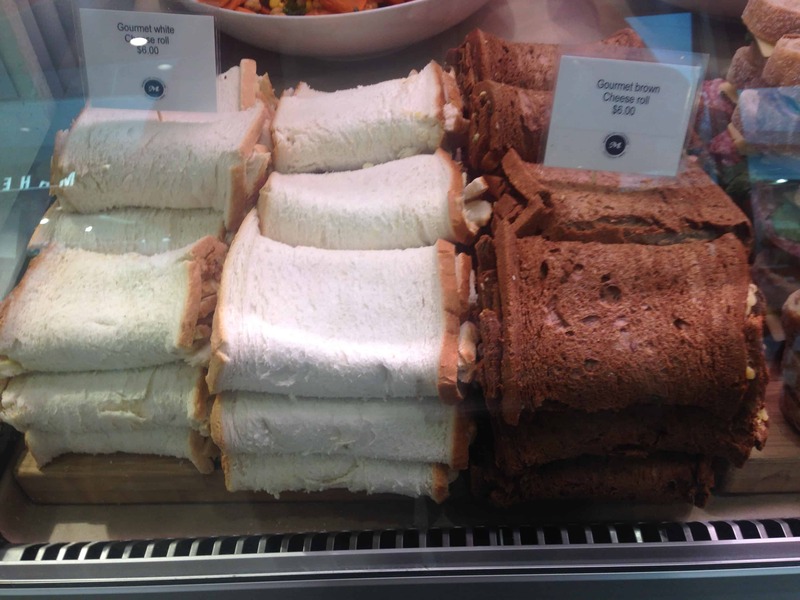 I couldn’t believe it when I first saw piles of rolled up slices of white bread sitting in the café display cabinet. You can even buy them from the supermarkets and take them home to cook up for a treat. 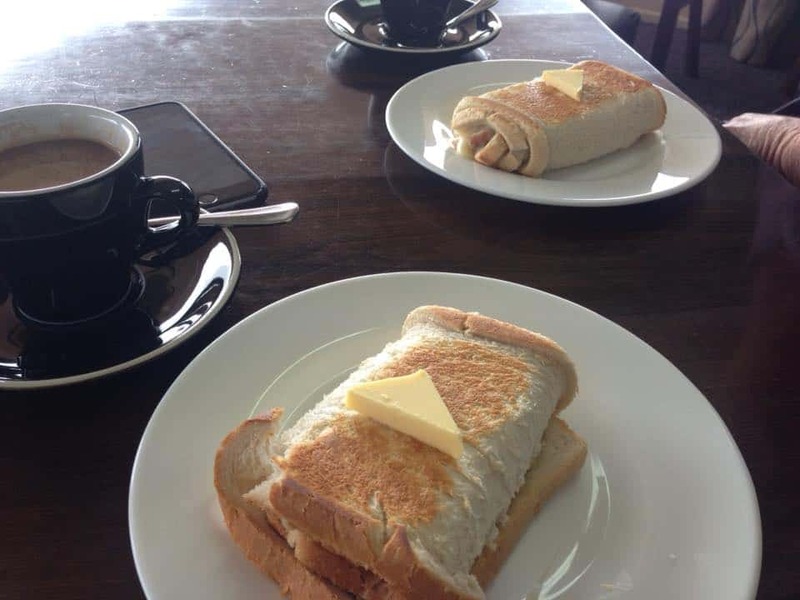 A cheese roll is basically a slice of (usually white) bread, spread with a mixture consisting of grated cheese, onion soup mix and condensed milk. A “gourmet” version may contain mustard. The rolls are made up and placed decoratively in the cabinet ready for toasting in the sandwich press toaster for the customer. They’re generally served with a thin sliver of butter on top for smearing over the warm crispy surface. Up for new challenges, we dived in. In fact we had several attempts to find the best. 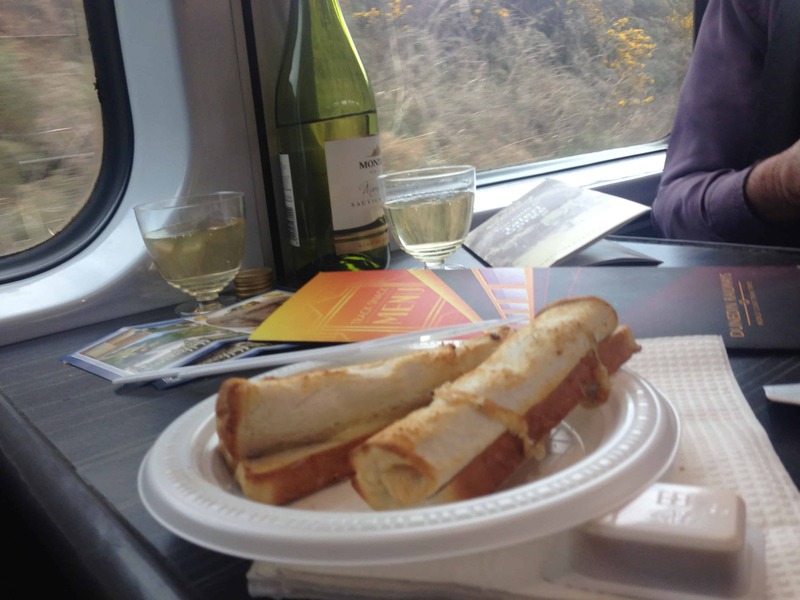 Some were very average, and we found our favourites from the cafeteria on board the Taieri Gorge train. What’s not to love about a cheese toastie? That oniony-cheesy filling melts to just the right consistency as the bread toasts all crispy, that wonderful smell of melting cheese. A real treat, and despite my earlier misgivings I could see why they’re so well loved. 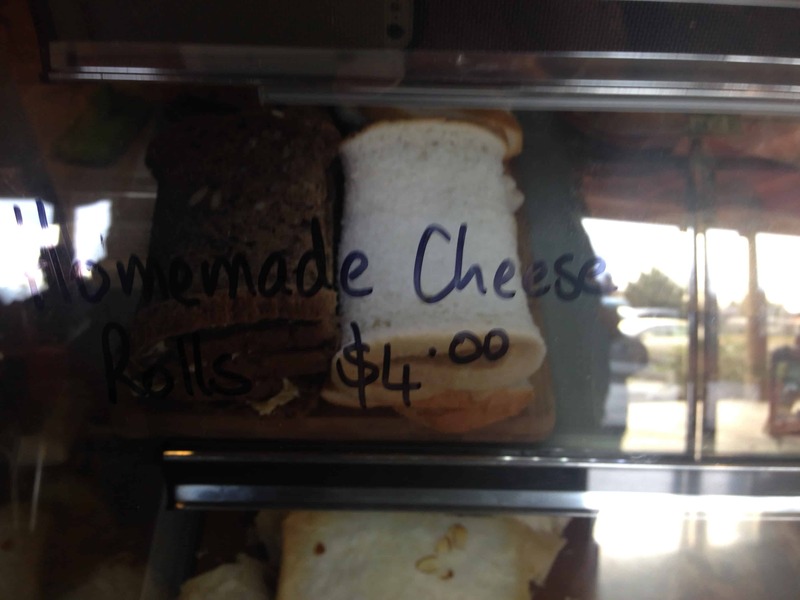 I believe these delicacies originated in Dunedin but Cheese Rolls can be found in most South Island cafes and pubs. They even hold hotly contested cheese roll competitions, with prize-winners proudly sharing their family recipe in the local newspapers. A national treasure to be sure. Also sold everywhere, the lolly cake is something I just couldn’t bring myself to try. Although when you think about the ingredients they’re probably no worse than say rocky road, which I love. All sugar. There is a base “cake” mixture made of crushed malt biscuits, condensed milk and melted butter. 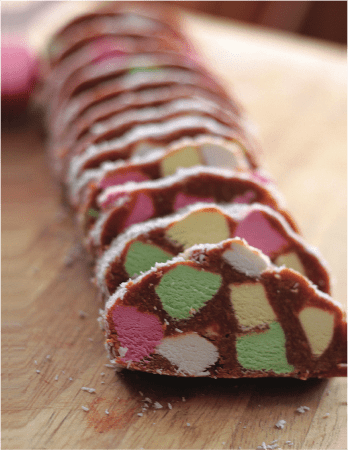 Then any kind of lollies are mixed in and then it is all formed into a log shape, rolled in coconut then refrigerated. 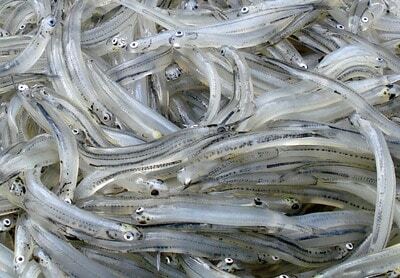 Now white bait is something I had heard of before and was looking forward to trying in New Zealand. Again, I believe it is specific to the South Island. Whitebait fishing is a historic pastime, and throughout much of the South Island we found enthusiasts casting their nets wide into the estuaries and hauling in their catch of the tiny morsels. 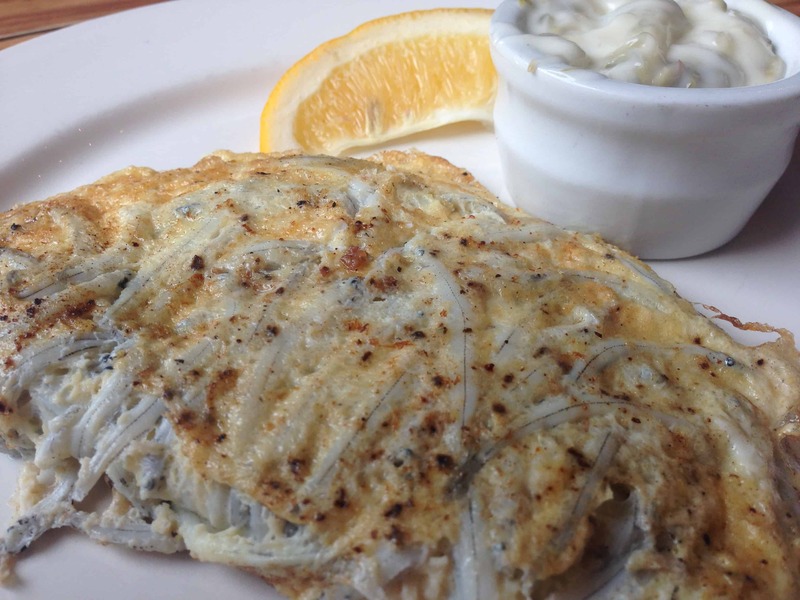 Kiwis love their whitebait. 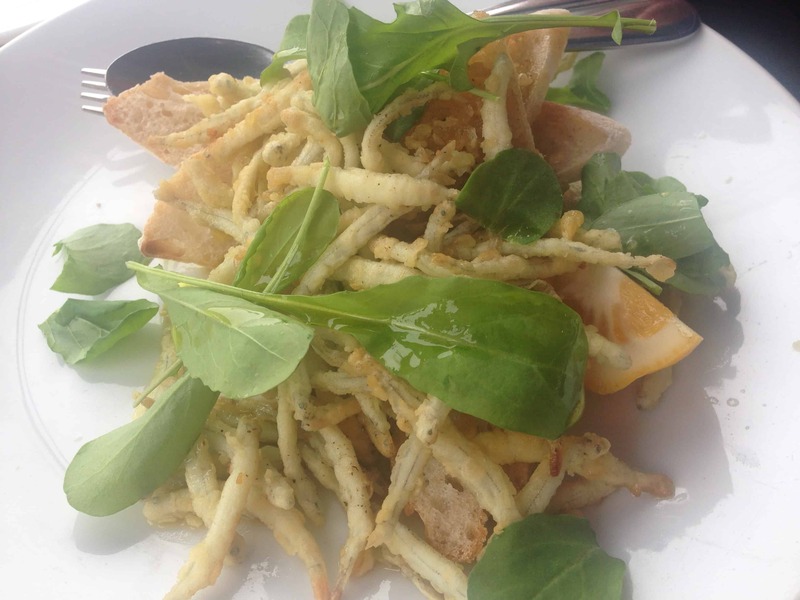 We managed to try whitebait a few different ways. Our favourite by far was at Dunedin’s The Best Café (quite famous in Lonely Planet and Trip Adviser terms), where they bundle it up in a batter and deep fry the bunch, just like a crispy fritter, served with homemade slaw, chips and a lemon wedge. I was so keen to get into it I forgot to take a picture. The runner-up would have to be the Boatshed restaurant in Nelson. Cooked individually in a tempura style batter. The most common style was like a plain omelette with whitebait mixed in. The purveyors of this style claim theirs to be the true traditional whitebait fritters, generally served simply with a lemon wedge, salt & pepper, or sometimes between two slices of buttered white bread. Again, grand competitions are held to find the winning recipe for the best whitebait fritters. If you’re in Dunedin, make sure you go to The Best Café in Stuart St. Nothing fancy, just great fresh seafood served simply. And if you’re lucky enough to stop in at Lawrence as you drive between Dunedin and Queenstown, stop in at Gabriel’s Café, where they serve nice whitebait patties atop wonderful fish & chips, with great service. 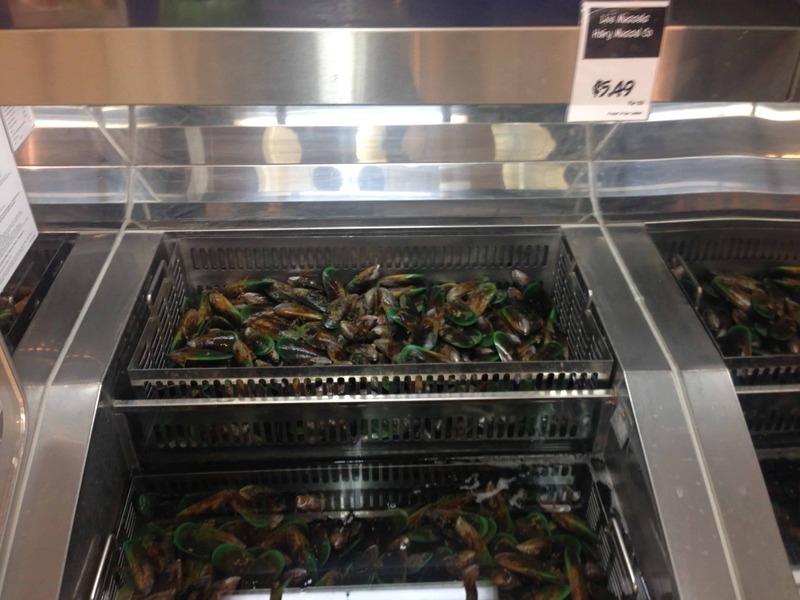 Green lip mussels are sold in most supermarkets and convenience stores in New Zealand, even the small local 4 Square store. The mussels are stored and temptingly displayed in a clear Perspex box with filtered sea water washing over them to keep them fresh. What a great idea! We didn’t buy any mussels to cook for ourselves as they are quite inexpensive to order in a café and the servings are generous. 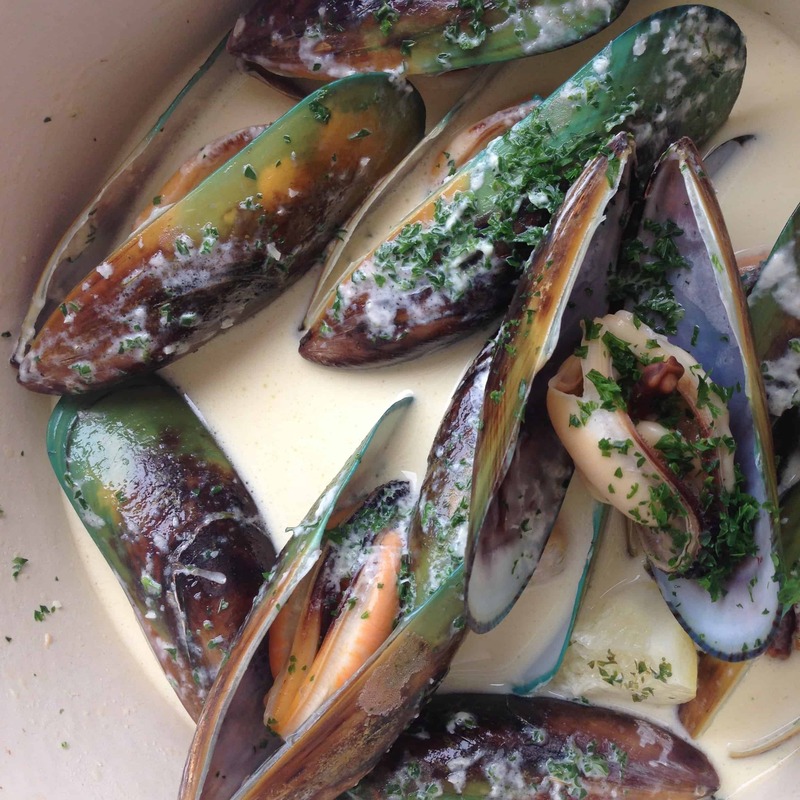 We found the preferred option to serve mussels in NZ is in a creamy white wine sauce, a la Françoise. 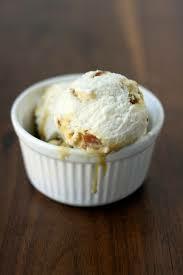 Pieces of honeycomb stirred through vanilla ice cream. Kiwis are besotted with the stuff. Lawrence is famous in the region for having the best ice cream in the South Island (subjective opinion by locals), and people drive from all over just to buy ice cream. We were told that invariably, having perused the vast selection, most people will say they’ll just have the hokey pokey because they love it so much. A great advantage we enjoy by traveling slowly is to eat good quality, fresh local produce and to understand the regional styles of food. We’re always grateful for the opportunities we have to eat so well. Just as well you are walking so far and often. Thanks for the tips on top food spots, when I get to the south island I’ll know where to go. It’s true, we are walking a lot, though I’m not sure that will help to keep off the travel weight. Lots of great eating places around the South Island, happy to share with you when the time comes.